Today was just right for a light dessert. 1. Using a fork, break up cream cheese in a medium bowl. Drain off any liquid from the yogurt; add yogurt to the bowl along with the honey. Using an electric mixer, beat at high speed until light and creamy. Stir in lemon zest. 2. 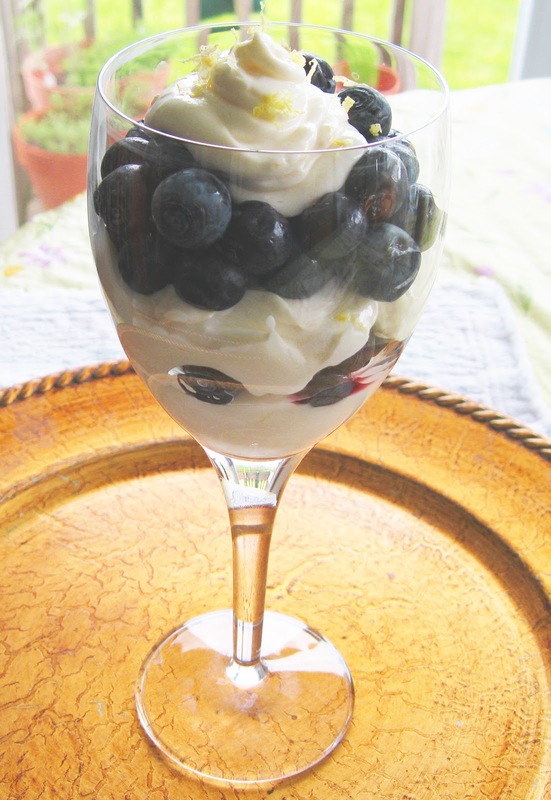 Layer the lemon cream and blueberries in dessert dishes or wineglasses. If not serving immediately, cover and refrigerate for up to 8 hours. Kroger is the only grocery store where I have been able to find the low carb yogurt, which also happens to be their store brand. Since I no longer have any of my cake decorating supplies, I found a tip on Pinterest for DIY pastry bag - place frosting (or in this case the lemon cream) in a zip-lock plastic bag. Cut the tip = pastry bag. Made piping the top easy. A sprinkling of lemon zest added to the beautiful presentation. As the recipe states you can use any fresh berries with this dessert.